On 9.12.14 this was the second kit I demonstrated on Jewellery Maker. The kit contained lots of S-Lon in sophistocated neutral, earthy colours and a selection of tiny seed beads, ranging from 2mm to 4mm. The star of the kit for me was a bag of 2mm faceted gold cubes, which were a completely new bead for me. To make these designs other beads of these sizes can be used. This looks as if it belongs in the exclusive gift shop in the British Museum or the Victoria and Albert Museum. They often get designers to recreate the treasures of antiquity and that is what makes this necklace so special to me. Cut 1m x 8 of brown SLon. Braid for approximately 10-14 cm. Stop when the cords are on either side of the dots. 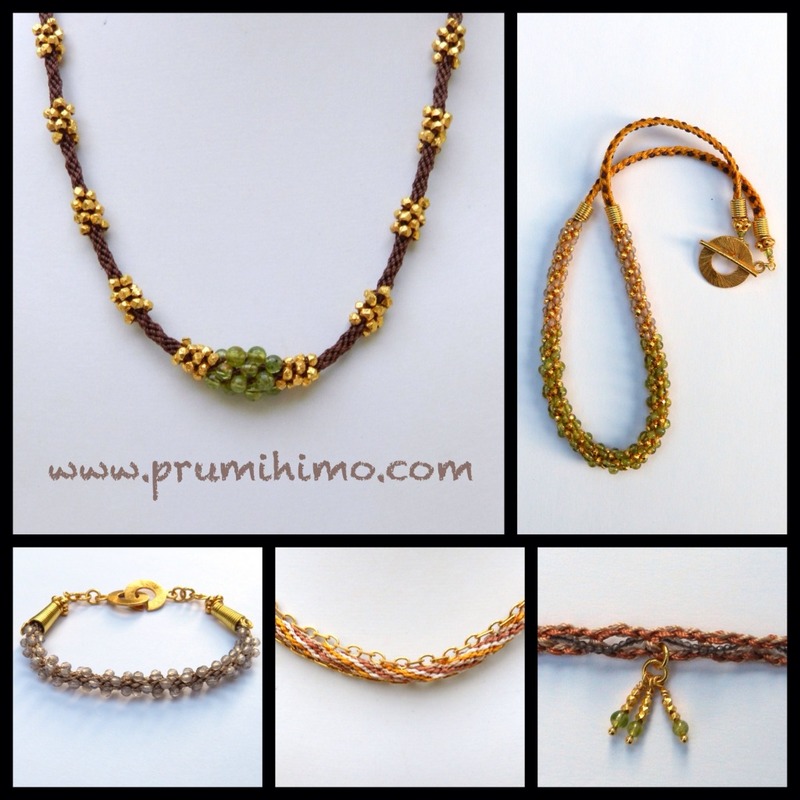 Braid in 2 gold beads from each cord. Continue to braid until the cords reach the next set of dots. Keep on braiding until the cords reach the second set of dots. Braid in 2 gold beads from each cord and continue to braid in this manner until there are 5 groups of beads and 5 equal gaps. For the central section braid in 2 gold, followed by 2 peridot and 2 gold. Repeat the braiding so that the second half matches the first half. Finish off with fold over ribbon ends or simple glue-in clasps. This is a simple Round Braid bracelet, with 2 cords in 6 of the slots on either side of the dots and 2 longer cords in slots 32 and 16 with the beads on them. Thread 30 beads on each of the 2 cords. This necklace was demonstrated on the show. It is worth watching the YouTube recording to see the way the braid structure changes and the core is worked. Click here. Position 2 brown cords in slots 8 and 25 and 2 gold cords in each of the remaining slots on either side of the dots. Braid using Half Round Braid for 10-15cm. Remove 8 cords from the disk. This should include all 4 brown cords and 4 others taken from different slots. Rearrange the cords so that there is one in each slot on either side of the dots. Twist together the 8 cords which have been removed from the disk. Hold them loosely over the dot in the south position and perform the usual top down/bottom up moves making sure that the core cords are kept in the middle. Braid in the beads. Replace the cords in the starting positions and braid the last section of the necklace in Half Round Braid. 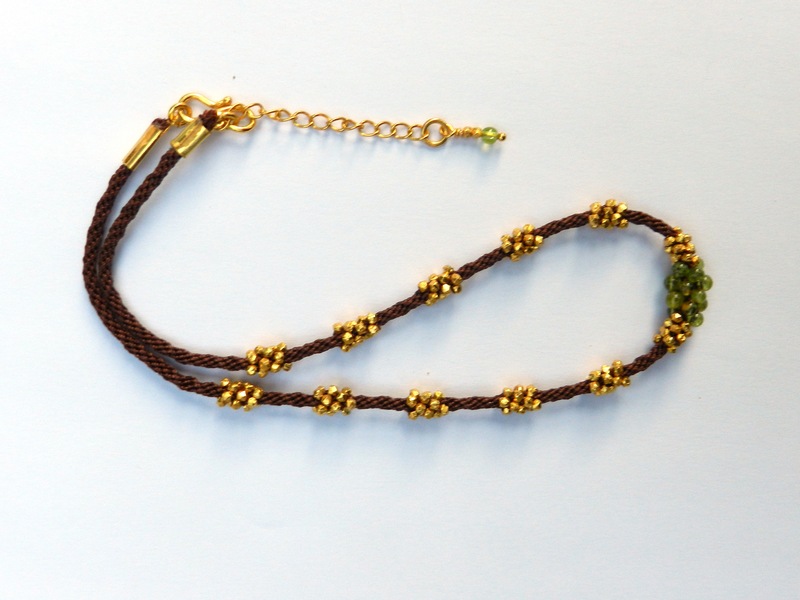 A coil of wire can be threaded onto the braid on either side and pushed up against the beads before the clasp is added. Make a 16 cord Round Braid. Use a needle to sew chain onto both sides of the braid. Care needs to be taken not to twist the braid as you work. Fold over cord ends are perfect for this necklace as they can accommodate both the braid and the chain. Press down hard to close the ends and the braid will compress enough for the chain to be trapped too. Such small beads are best used as embellishments on finished braids because they are difficult to thread and do not go very far. I used them to weave in and out of a ladder braid for a bracelet. I do not currently have instructions for ladder braid on this site, but they will be available shortly. Tiny beads are very effective if they are simply sewn onto a finished braid with a beading needle or wire wrapped around a braid. They can be wrapped around earring findings and hung on featherweight headpins to make delicate earrings.